The Sons of Norway are once again saying Velkommen as this year’s holiday celebration is sneaking closer. 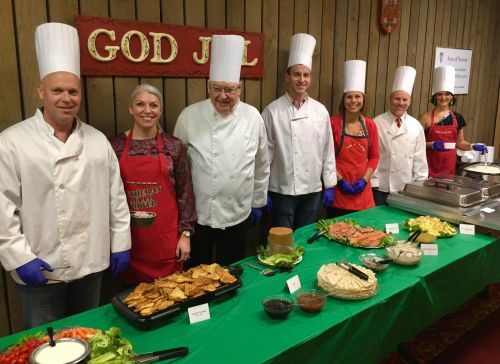 The 14th Annual Traditional Norsk Christmas Event will take place on Friday, November 30th starting at 6pm. Hosted by Frode Tilden at the Sons of Norway there will be a lot to take in. The event is sure to be a blast with multiple different types of Norwegian food and music by two local groups; The Front Fenders, and Charley Johnson and the Moving parts. If you are not familiar with the traditional Norwegian holiday fare this can be an introduction to what may become some of your favorite holiday goodies. While the event may provide you with a more precise knowledge of the fare. I am going to do my best to outline the foods that you may be trying as you venture into the Sons on the 30th. I didn’t see lutefisk on the list anywhere though, and this has me wondering if any will be present. As a guest I expect you to try everything. Even if it is lutefisk, so we’ll start there. Lutefisk for those who don’t know when directly translated is Lye Fish. It usually starts with a salted white fish which is then cured or preserved in lye. This dish was originally created in order to have fish and protein during the cold stark winters in Norway. Without refrigeration this was one of the techniques used. The Kransekake or Wreath cake translated is a traditional Danish and Norwegian cake. This cake is made with a stacking of concentric rings or wreaths thus the name. Traditionally made of almond cake and garnished with a white frosting. The perfect Kransekake is hard to the touch, but with a soft and chewy mouthfeel. The cake is served by separating the individual rings and breaking them into pieces to consume. The meatballs and salmon are something pretty familiar to most of us up here, as meatballs are served almost everywhere and based on the preparation of both I think we know what we are getting ourselves into with these two items. Rømmegrøt is a Norwegian porridge produced by combining sour cream, milk, wheat flour, butter and salt. This dish is usually drizzled with butter and then topped with sugar and cinnamon. It is often served with cured meat. Flatbrod or flatbread for those who can not pick out an easily identifiable cognate is a traditional unleavened bread that is eaten with cured meat or fish. It is unleavened and it’s three basic ingredients are barley flour, water, and salt. This was a staple food for the Norwegian working class. It is a very important part of food traditions although the majority of flatbrod produced currently is commercial. I know I haven’t mentioned it yet, but there will also be lefse, if there were not, I don’t think this would be a true Norwegian Christmas. All of this will also be served with a warm drink called Glogg. This is a Norwegian mulled wine and it is sure to put some hair on your chest much like the Norse gods of old. If you enjoy trying decadent dishes presented by our friends at the Sons of Norway make sure you pick up your tickets now. They are available for sale at Stabo Scandinavian Imports, and Scandesign. This is sure to be a roaring good time full of friends, music, celebration, and feasting fit for Val Halla!